Lockjaw takes Ben Grimm on a visit to the alternate dimension "Earth-A", where Reed Richards has become the Thing instead of Grimm. Galactus returns to Earth to make Silver Surfer his herald again, but Reed tricks him by sending his ship into the Negative Zone. Kala, Tyrannus and the Mole Man all battle for rule of Subterranea. Ben Grimm encounters the Femizon Thundra, the newest member of the Frightful Four. The being called Him is found by the High Evolutionary, who is in the process of creating his own "counter-earth". The sinister Man-Beast and his rebel New-Men attack and the newly-renamed Adam Warlock descends to Counter-Earth in pursuit, but not before the Evolutionary grants Warlock a mysterious "soul gem". Pluto, Olympian God of Hades, attempts to gain Odin's soul but is repelled by Hela, Asgardian Goddess of Death. Odin manipulates Ego-Prime into triggering the latent powers of three humans into becoming Young Gods (chosen to later be given to the Celestials). Thor and the Asgardians vie with Mephisto in his dimension. The Hulk is put on trial with Matt Murdock as his lawyer. When the Hulk is re-shrunken to Sub-Atomica, he encounters the fantasy-creating Shaper of Worlds. Then the Hulk helps Jarella and her forces regain the throne of K'ai from the usurper Visis. While the Hulk meets Banner's double on Counter-Earth, Betty Ross marries Glenn Talbot. The Sub-Mariner is caught in a struggle between Dr. Doom and Modok for possession of the Cosmic Cube. While fighting Byrrah and Llyra, Namor finds his cousin Namorita. He asks his old friend Betty Dean to care for her. Iron Man encounters the other-dimensional Black Lama, and fights his disciple, Raga. Spider-Man gets caught in a gang-war between Doctor Octopus and the criminal Hammerhead. He also develops an ulcer and Aunt May becomes Octopus' housekeeper. Captain America and the SHIELD Femme Force (headed by Agents 13 & 14, Sharon Carter and the Contessa) battle HYDRA, the Kingpin and the Red Skull's 5th Sleeper robot. The now-insane Captain America from the 50's resurfaces. Clint Barton relinquishes his Goliath identity and becomes Hawkeye again, while Hercules and Avengers past and present liberate Olympus from Ares and the Enchantress. Hank McCoy, working for the Brand Corporation, develops an experimental mutant growth hormone which further mutates him into a blue-ish, furrier Beast. He is secretly monitored by the Secret Empire. 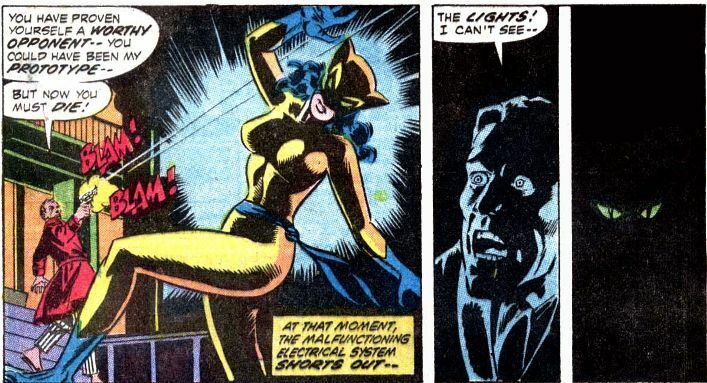 Patsy Walker (now Baxter) learns Hank's secret identity. The Defenders (Dr. Strange, Hulk & Namor) try to aid the Silver Surfer escape the earth, but end up in the realm of the Nameless One. They escape with a rescued (but now-deranged) Barbara Norris. Dr. Strange battles Sligguth and various other forces of the ancient and evil Shuma-Gorath. Eventually, the Ancient One's physical form is sacrificed to save Earth from Shuma-Gorath's invasion. With the Ancient One's passing, Stephen Strange becomes Earth's Sorcerer Supreme. In LA, Jack Russell reaches his 18th birthday and becomes a werewolf by night. Russell discovers the occult book, the Darkhold. Dracula is resurrected in Transylvania when a lost relative, Frank Drake, appears to reclaim Castle Dracula. Rachel Van Helsing surfaces in pursuit of Dracula and the so-called "Vampire Hunters" are formed. Framed inmate Luke Cage undergoes a prison experiment and becomes a bullet-proof "hero for hire". Greer Grant (Nelson) becomes the Cat from a series of medical experiments to enhance agility and "female intuition". Johnny Blaze makes a deal with Mephisto and is bonded with the demon Zarathos to become the Ghost Rider. While battling AIM agents in the Florida everglades, Ka-Zar meets Barbara "Bobbi" Morse (SHIELD Agent 19, later Mockingbird) and the Man-Thing. The Man-Thing saves Jennifer Kale (cousin to Johnny Blaze) when she inadvertently summons the demon Thog. Shanna O’Hara travels to Africa to become Shanna the She-Devil, protector of wildlife. Yeah, it really became like a "Saturday Night Live/Creature Features" parody of 60s Marvel. I think it did get better - but then went down again soon after. My interest in the MU goes in cycles. mid-80's - 90's I skipped, but 00's was fairly interesting. 2010- 2015 I'm not interested in at all.